Dragon was a Canadian stop-motion animated children's series, based on the book series of the same name. The series ran from 2004 to 2007 on Treehouse TV, and aired re-runs on Qubo until 2016. Frank Meschkuleit voiced all the characters, and narrated the series. The series centered around Dragon and his friends, Alligator, Ostrich, Beaver, and Mailmouse. 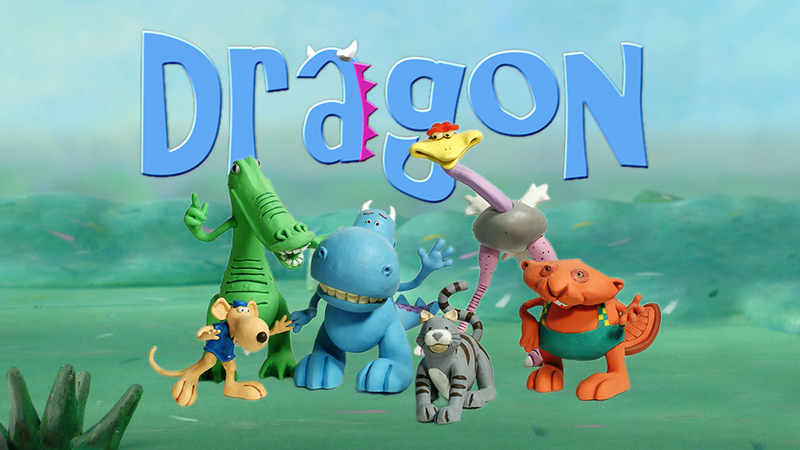 In each episode, Dragon and his friends explore themes that are identifiable to children, such as trying to find a new hobby, being afraid of the dark, etc. 1 A Friend for Dragon Found Available on Dragon's Special Day DVD. 5 Dragon's New Hobby Found Available on Dragon Valentine's Day DVD. 6 Dragon's Spring Cleaning Found Available on Dragon Spring Celebration DVD. 12 Ostrich to the Rescue Found Available on Dragon's Special Day DVD. 15 Dragon Looks For Cat Found Available on Dragon Valentine's Day DVD. 17 Dragon's Yard Sale Found Available on Dragon Valentine's Day DVD. 24 Dragon's Special Day Lost Available on Dragon's Special Day DVD. 25 Dragon's Be My Valentine Lost Available on Dragon Valentine's Day DVD. 1 Dragon Runs the Store Found Available on Dragon Spring Celebration DVD. 9 Cat's Birthday Lost Available on Dragon Spring Celebration DVD. 25 Dragon's Spring Celebration Lost Available on Dragon Spring Celebration DVD. In total, there were 78 episodes, but only 41 can be found. 3 DVD compilations of Dragon episodes exist, containing 6 lost episodes. Many of the found episodes can be found on the official Knowledge Kids website, and the WikoKiko YouTube channel. Dragon IMDb page on Dragon. List of Treehouse TV DVD releases. Latest archive of Qubo's show list that includes Dragon. List of Dragon episodes on the Knowledge Kids website.